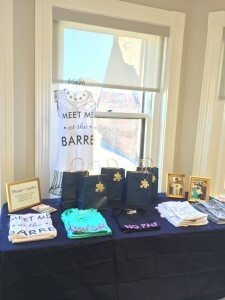 Getting Fit & Fab with JL Boston - The Junior League of Boston, Inc.
On March 19 the Junior League of Boston kicked off spring with an amazing health and wellness event that featured fitness classes, massages, a wellness seminar and more. Fit & Fab Lab guests also benefited from massages and injury screenings by Joint Ventures Physical Therapy and a wellness seminar about women’s empowerment through physical and emotional help, with Crossroads of Fitness coach Garrett Wood. The Junior League of Boston raised about $1,300 during this year’s Fit and Fab Lab, and hopes to turn this successful fitness and wellness event into an annual Junior League of Boston signature event! All proceeds from the event go directly back into the community to support the health and wellness of women and girls in the Boston area. Thank you to Samantha Soukamneuth, Rachel Deering, Hayley Hannan, Marisa Roman and the rest of the Small Events team who spent months planning this special event. JLB member Jess Pickney also brought clothing from her start up company, Pieced 2Gether, a clothing company where all clothing is made by men and women with autism.